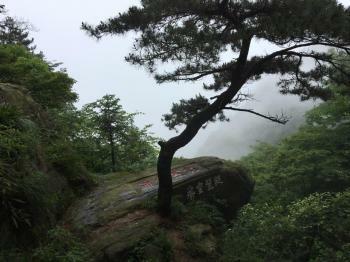 Lushan National Park is a cultural landscape known for its natural beauty. It has inspired many Chinese artists, writers, philosophers and scientists. (Mount) Lushan can be accessed by a 22 kilometer long curved road from Jiujiang. Lushan is an eclectic site, and not having found much information about it in my guidebook or on the internet, I started with buying a map at the local bookstore. It had many places marked on it but I could find only a couple of the sites named in the WH nomination. As I have seen enough of sacred mountains (and their cable cars and turtle rocks) over the past weeks, I decided to focus on Lushan’s villas. These were built here from 1895 onwards by Europeans and Americans, turning Guling (the little town on Mount Lushan) into an internationally known summer resort. The Meilu villa is the one closest to the bus station. 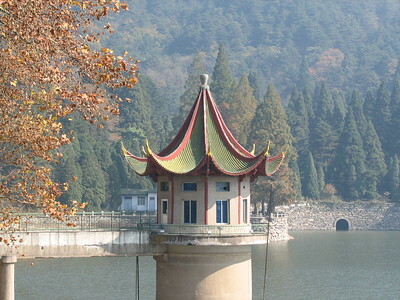 It was constructed in 1903 by a Lord Reynolds and later used by Chang Kai-shek. You can get inside. Further down the road there are many other fine villas, like the Williams house and notably the group built by American missionaries. Walking around in this area does feel like you’re not in China anymore (the traffic in and around town is pleasantly low too). On the other side of the valley there are more natural or traditional Chinese sights. What to think of the Three Ancient Trees? The three (one gingko and two cryptomeria) were reportedly planted in the 3th-5th century and stand now 39 meters tall. A subject only slightly touched at the ICOMOS evaluation of this site is its connection with 20th century Chinese politics and the history of the Chinese Communist Party. This is one of the most clear features however. Lushan is famous for its ‘Lushan Conference’ in 1959, when Mao Zedong asserted his power and led him to proceed with the Great Leap Forward. Mao had a house here too, which now holds the Lushan Museum. It’s a spacious building where much of the period furniture has been preserved. One can even have a look at Mao’s bathroom (which surprisingly features a western style toilet!). Visited June 2017. Lushan National Park is located in the northern part of Jiangxi province and can be easily reached from the city of Jiujiang; there are many buses and minibuses from the long-distance bus station, at least one every hour till 6 pm. (Jiujiang is also a good starting point for the trip to Poyang Lake/Nature Reserve, on Chinese tentative list, already deferred at the beginning of ’80, and re-submitted in 1996.) The entry fee for the park is 180Y – you have to pay it while still in the bus, at the main gate to the park. The bust stop is located in Gulingzhen village, where there are also many places where you can spend a night or two (we slept in one of these old villas and recommend choosing a villa instead of hotels), shops and restaurants. By the bus station you’ll see a huge tourist information centre with a very big UNSESCO sign above the entrance and… no one speaking English, French or any other language but Chinese. The park is pretty big and if want to get as more as possible from it, you’ll at least two days. But if you just want to thick it on your list, one day is enough to see the most important places/monuments, but be ready for a long and sometimes very steep walking. You can hire a taxi but remember that here everything is more expensive than anywhere else in the area or take one of two tourist buses that sell only one week tickets for each line, so it doesn’t make any sense to buy one if you’re staying just a day or two. Probably you’ll need a map; you can buy in at the post office, a small bookshop or any souvenir stall in the heart of the Gulingzhen village. Lushan is a cultural site that for many centuries inspired and still inspires Chinese artists. And it means that it is a must to see the landmarks of the park, among them temples, inscriptions, waterfalls, rock formations and… three precious trees, very old and very impressive. Close to them is Temple of Yellow Dragon. Only part of this temple is original, most of it is just a reconstruction from 90s. If you want to see Lusha Park from above, it is possible to take one of three ropeways. In my opinion the western (Xinglong) one gives you the best views and access to a suspended bridge! And from there you can walk to the most interesting part of the park, passing by some old pagodas, small temples and pools. You’ll see also a lot of inscriptions, now paint in red to be better visible – some of them are hundreds years old, and read about the beauty of the place, the beauty of life… In the northern part of the park, you can see some temples, Imperial tablet pavilion and another very popular tree: Stone pine (on the photo). With an inscription, of course. Proposed as a Mixed WHS by China, but at Bureau meeting in Merida this was rejected: "The Bureau also decided not to recommend the inscription of the property on Natural Criteria"
Communism: The Park includes former residences of Mao Zedong (1960) and Lin Biao (1970). Built or owned by Americans: Several villas were built by Americans (particularly missionaries) in the late 19th/early 20th century (see 359, 286 and 442 in the link).